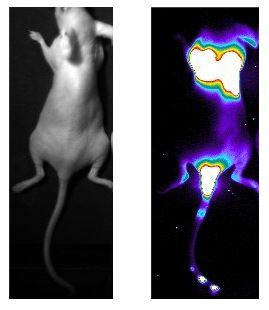 shanghai Model Organisms provides services for microCT and IVIS whole-body in vivo imaging/fluorescence quantitative analysis of small animals. Sample requirements: Live mice or local specimens of mice. The bone samples of mice, rabbits, and dogs should not exceed 10 cm in length. Principle: X-ray tomography and computer reconstruction are non-destructive 3D imaging techniques used to study the internal microstructure of a sample. The difference between micro-CT and conventional CT is that the resolution of micro-CT can reach the micron level. Notice to customers: Do not decalcify fresh or fixed specimens used for scanning. Contrast-assisted imaging is required for tissues such as liver, blood vessels, and intestines. Figure 1. 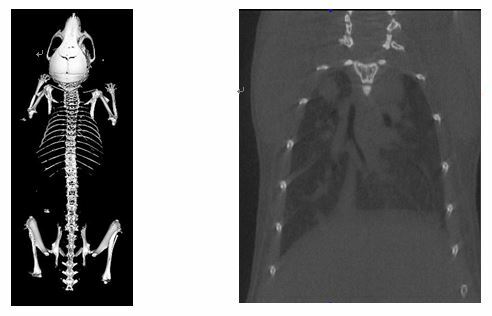 Left panel: A screenshot of the skeletal image of an entire mouse; Right panel: Scan of lung tumor. Principle: The luciferase reporter gene system is a reporter system that uses luciferin as a substrate to detect the activity of firefly luciferase. Luciferase can catalyze the oxidation of luciferin to produce oxyluciferin and this oxidation process emits bioluminescence. A fluorometer, also known as a luminometer or a liquid scintillation counter, can measure the bioluminescence released during the oxidation of luciferin.